This is an interesting video I found that Tim Carter made. He is famous for starting the website called Ask The Builder. An approach for how to make a cabinet fit when the corner bead on the walls is in the way. I’m not really sure that I would ever let a customer see me do something like this video demonstration. There are several steps involved when securing wall cabinets to metal studs. It’s important that you use the correct fasteners to secure your upper cabinet to the steel studs. 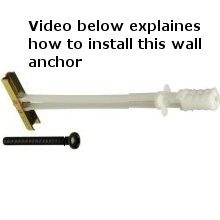 This article will walk you through the proper procedure for mounting your bases or uppers to the walls. First off, if you are just hanging standard size kitchen cabinets, you can install them just as if you were securing them to wooden studs. It is only when there is going to be a lot of weight in a cabinet that you need to use the fasteners that are demonstrated in our video. If you are getting cabinets from Home Depot or some other super center, you will have to attach the wall scribe fillers yourself. Kitchen and bathroom cabinets are generally made in three inch increments. If you have three thirty inch wide cabinets and a ninety three inch measurement from wall-to-wall, you will need to install fillers on each end of the cupboard run. In this scenario, it would be best to attach an inch and a half (1-1/2″) wide scribe board on either end next to the wall. Walls, floors and ceilings are never flat. 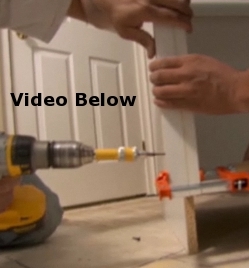 You may have to fit the cabinet filler to a curve in the wall. Most standard fillers are three inches in width straight out of the packing box. 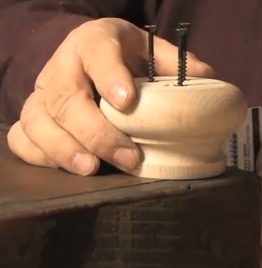 There are two methods used for attaching wood feet to any cabinet. This is a great way to enhance the look of any bathroom or kitchen cupboard set. You can also make dressers, trunks, cedar chests and furniture look more expensive and high-end by attaching wood feet to them. There are many different styles of bun feet available in several wood types. We recently did a review of Osborne Woodworking Products and found that they have a nice selection of round, tapered and fluted feet for cabinets and furniture. All of the wooden support legs that you will find need to be stained, sealed, finished or painted. They are generally available in many unfinished wood selections.